Jean St-Germain opened a futuristic restaurant near his hometown of St-Simon in 1992. Its roof evoked an alien spaceship. In addition to patenting scores of inventions, Jean St-Germain also found time in his unorthodox life to father 12 children, run a parachute school and build a pyramid on his property near Montreal so he could engage in spiritual pursuits. Mr. St-Germain, a grade-school dropout and former army paratrooper who became a prolific inventor, died Sept. 16 at a hospital in Saint-Hyacinthe, Que. He was 79. He suffered from kidney problems and had been diagnosed with pancreatic cancer. Mr. St-Germain was what his fellow francophone Quebeckers call a patenteux, an expression derived from the English word patent, used to describe a tinkerer, someone skilled with mechanical things. He didn't mind the label. One of his sons, Daniel, recalled his father would sometimes answer the phone by saying "this is St-Germain the patenteux speaking." He was famously credited with designing, while he was still a teenager, a baby bottle with a plastic liner that collapsed to prevent infants from swallowing air – a concept he sold for $1,000. Some of his other ideas were more lucrative but he didn't care for bookkeeping and was often in trouble with tax auditors. "He earned a lot but he spent a lot," his son said, explaining that his father saw himself as an artist. Mr. St-Germain's achievements came despite his lack of formal education. He was born March 29, 1937, the seventh of the 11 children of Alphonse St-Germain and Rosalie Tétreault. His parents were farmers in the village of Upton, an hour's drive east of Montreal. After repeating Grade 4 twice, he dropped out of school. He was 16 and babysitting the child of one of his older brothers when he wondered why his sister-in-law had to pat the infant's back after a bottle feeding. He tried to find a way to alleviate the baby burping and experimented by using a condom as a liner to eliminate air pockets inside the bottle. He said he sold the idea to an Ottawa businessman who likely made a mint reselling it to U.S. manufacturers. ‎‎"He never resented it. At the time $1,000 was a lot of money," his son said. After working in laundry, then construction, Mr. St-Germain enlisted in the army in 1954, joining the Royal 22nd Regiment, the unit of his older brother Fernand, who had died in Korea when his patrol strayed into a minefield. Mr. St-Germain trained as a paratrooper and was posted in West Germany. While there, he built a seven-foot-tall clock celebrating his regiment. Powered by the motor from a sewing machine, it played the regimental march, Vive la Canadienne. 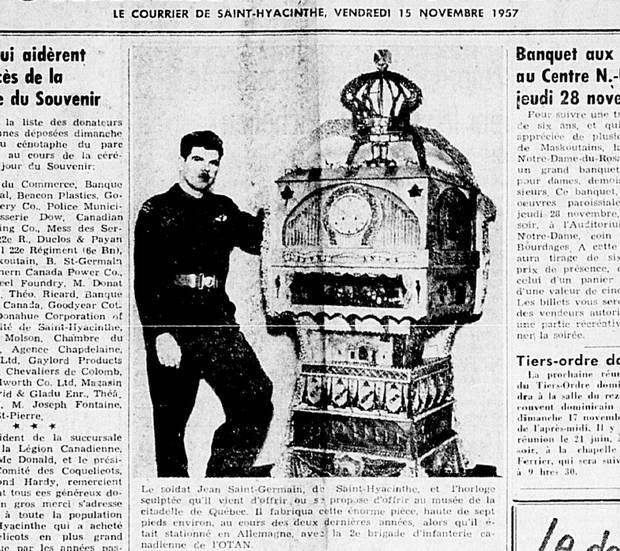 In 1957, Jean St-Germain, then a 20-year-old paratrooper posted in West Germany, was featured in his hometown paper after he designed a giant clock that played his regiment’s marching song. Back in civilian life, he started a family, taught parachuting and settled in the Saint-Hyacinthe area. Filled with various inventions, his property was described by a La Presse journalist as "a mini-Disney World." Mr. St-Germain's lifestyle gave his children an unconventional but stimulating upbringing. "I had one of the best childhoods. At home, my father always had a project going on. There were always tradesmen coming to the house to work on his plans," his son said. Daniel remembered machines being built and tested outside his house. Among the devices Mr. St-Germain created were an ultra-light aluminum plane, a miniature helicopter, and a small tractor that towed cross-country skiers. 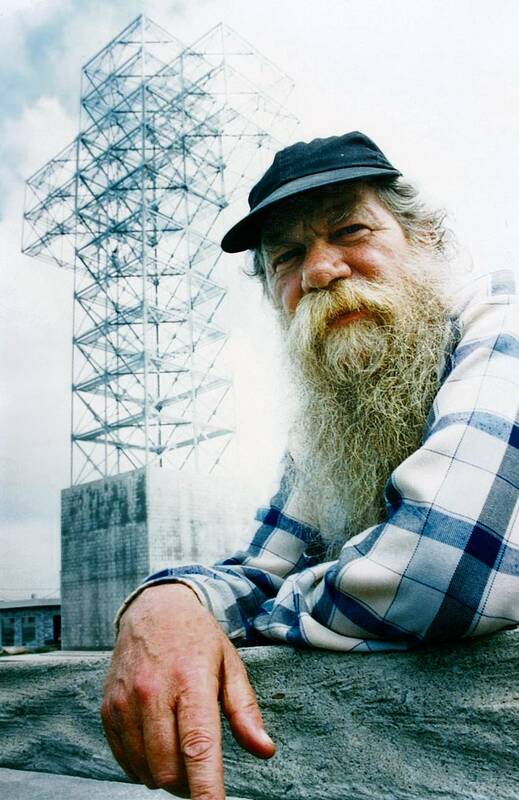 His patents included a snowmobile safety throttle, an airflow deflector that attached to the rear of trucks, and a mobile construction scaffold system. At one point, Mr. St-Germain ran a parachute school, so the family lived in an aviation hangar next to a 1930s-era DC-3 transport plane. "Imagine you're five or six years old, you go outside after dinner and you see this iron angel parked near your home," Daniel said. He also remembered his father sketching potential inventions on paper place mats while they sat in restaurants. One of Mr. St-Germain's more successful ideas was the Aérodium, a 12-metre-high silo with a propeller at the bottom that acts like a vertical wind tunnel, allowing people to soar in the airflow and experience the sensation of skydiving. Mr. St-Germain was featured in People magazine in 1982 when the American real-estate tycoon Marvin Kratter paid him $1.5-million (U.S.), for the franchising rights of the Aérodium. Around that time, Mr. St-Germain built a 10-metre stone pyramid on his property and touted its healing powers to people who paid to meditate inside its chamber. The project was vetoed, however, by the Quebec farmland zoning board. Mr. St-Germain meanwhile went to Atlantic City to see if pyramid power improved his luck at gambling. He told the UPI news agency that he arrived at the Tropicana Hotel and Casino with a $1,000 investment, won up to $100,000 but ended up losing all his initial gains. He said he had prepared by standing for five hours in his pyramid as he chose 2,000 numbers that he would play on the roulette wheel. "It was my fault," he told the UPI reporter. "After choosing the first thousand numbers, I became tired, after standing for so long. So then I picked the second thousand numbers too quickly." A La Presse article from the same period said Revenue Canada alleged Mr. St-Germain owed $159,000 in back taxes. Officials obtained a court order to open his safety deposit box but the bailiff only found 50 pennies inside. Mr. St-Germain said the 50 cents was his emergency fund – just enough to buy a pencil and a notepad, the only tools he needed as an inventor. He said the tax auditors were harassing him. "They can keep trying, I don't even have a push bike to my name." In 1992, he opened, near his home in Saint-Simon, a futuristic restaurant where fast food was served by mechanized robots. Mr. St-Germain’s restaurant was called L’Extra-Terrasse and food was served by robot-like devices. Housed in a circular building capped by a flying-saucer-like roof, the eatery was called L'Extra-Terrasse, a play on the French word for extra-terrestrial being. It was popular but Mr. St-Germain closed it after five months because managing a restaurant was not his strong suit. His next big project – a giant roadside cross with 2,000 lights that was a pilgrimage site with a wax statue of Jesus Christ and soil from the Holy Land – was also short-lived, ending in 2000 beset with financial problems. He filed for bankruptcy in 2002, declaring that he only had $200 in assets. His son said Mr. St-Germain was in poor health in recent years. His kidneys were failing and after he was also diagnosed with cancer, he decided to terminate his dialysis treatments, which ultimately resulted in his death. Daniel said his siblings each inherited some of their father's traits. One became a musician, for Mr. St-Germain could play several instruments, including the accordion, piano and guitar. Another worked in aviation. Daniel is a mechanic who has also tinkered, once inventing a mechanized dancing platform for nightclubs. "I am very proud to be his son," Daniel said. Jean St-Germain is survived by his wife, Adrienne Roy, and their children, Diane, Lucie, Gina, Josée, Jean-Michel, Sara, Daniel, Pierre, Nathalie, Anik and Alexandre. A son, François, predeceased him.